Garden Designers Roundtable – Lawn Alternatives! the past 60 years. Tired of boring monocultures, faced with restrictions on water use, and more sensitive to environmental impact, landowners and managers are reimagining their yards, and their views on lawns are changing. Its Garden Designers Roundtable time again on the Blue Heron Landscapes blog, and this month we’re talking ‘Lawn Alternatives’. I’m not anti-lawn, at least in regions of the world where it’s practical and sustainable, but I would like to propose that you consider an alternative thought process when considering your existing lawn or before establishing a new one. Instead of just grading your property, spreading grass seed, and buying into the whole premise that to be an upstanding neighbor, you need to have a lush green manicured lawn, consider the following questions and approach the design of your property and the inclusion of a lawn, in a more thoughtful manner. Here in the northeastern United States, drought is not an issue, but in arid regions of the country, the lack of water makes installing a lawn not only impractical, but irresponsible as well. Each year we hear of farmers out west having to bring water in for their crops from farther and farther away. Reservoir levels are dropping, rivers and streams are reduced to unhealthy levels for migratory fish and ground water is harder to find. Honestly, is having a patch of green really more important than any of these issues? Ok, so you are in an area of the country where water shortages are not an issue, good for you, you can have a lawn. Does the amount of lawn you desire however, match the amount of lawn you need? How large an area do your children need to play? How much of your property actually receives enough sunlight for a lawn to grow? Are there deed restrictions as to the uses of your property? Do you simply enjoy having a small patch of grass to walk barefoot in or have a picnic on? These may seem silly, but you’d consider some of the very same questions when purchasing the house, a car, or even new suit. So why wouldn’t you subject something you will be spending many hours each year with, to the same criteria? Does it work with the design? This is the most overlooked consideration when designing a property. Most often the lawn is considered separate from the garden. Why? They both are living planted environments, and they usually reside within the same boundaries. Lawn is not just a part of your yard it’s an important element in the design of your landscape, and of your garden. Where appropriate, an expanse of lawn can tie a garden together providing a resting space for the eyes or pathway or border for your creation. Lawn space is defining, engaging, and accessible, as long as it’s creatively used and proportionate with the design. This is a question for the ages. One person’s relaxation is another person’s afternoon of hell behind a mower. Once you’ve decided that having a lawn is appropriate for your region, proportionate with your needs, and is in harmony with your design, you’ll need to decide if you want to take on the task of maintaining it. It’s a question that can only be answered from within. For the record, I love having a lawn. I love the feel when walking on it barefoot, the smell of freshly mown grass, dew in the early morning, and I even enjoy raking in the spring and cleaning up leaves in the fall (especially when their dry enough to pile up and jump in!). What I grow increasingly tired of is large patches of singularity without the beauty found in a perennial border, or the weak growth under the shade of a mature tree, or unused areas of productive space, that could be planted with veggies. The classic yards from our youth have changed dramatically but with a little thought, and after answering a few questions, maybe we can recreate come of the magic, and in the process, give this planet a well deserved break! I would love to hear your answers to these questions and your feelings about lawns, please leave share a comment below, then follow the links below and see what thoughts our other bloggers have on ‘Lawn Alternatives’. 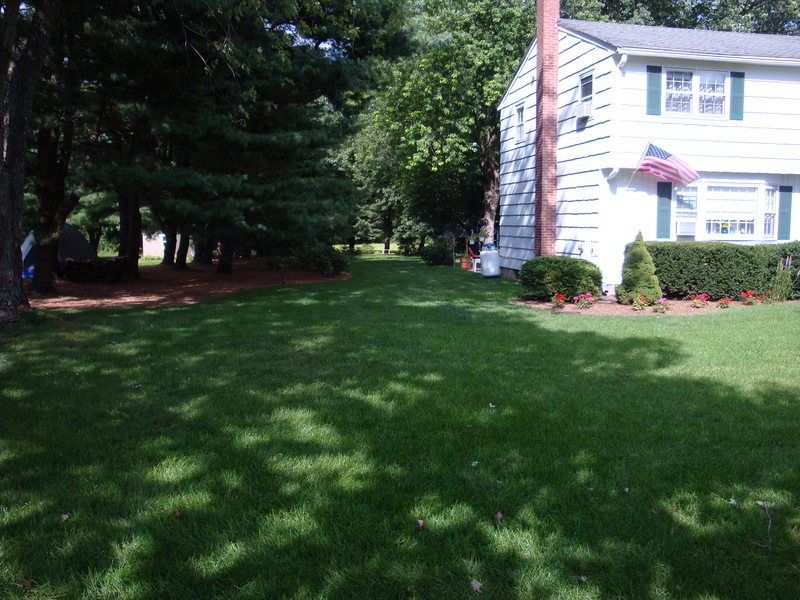 Too often the “lawn” is a reflection of the interior- wall to wall carpeting, vacuumed daily! I prefer to let Nature be Nature, and select easy care ground covers like lamium, sedum, succulents. Or gravel, raked a la Japonaise. . .
Great analogy Day! I like your thoughts on letting nature be nature, more should think the same way! In California the majority of Homeowners Associations require Lawns and that needs to be changed as goofy as it sounds water rationing on one hand and homeowners fined by HOA’s for ugly lawns. One man in Newport Beach spent 18,000.00 + to install top quality artificial turf to comply with water rationing and maintain the ascetic of his home and he’s now wrapped up in a suite with the HOA who wants him to remove it! Your example is exactly the mindset we need to move away from. Diversity is the key to healthy life, in nature and in humanity. Thank you sir! Lawn is all natural, and rain is not an issue. Love the term “Gardener’s Lawn”. It feels more connected! Scott, I am glad to see I’m not the only person today who is espousing the alternative of using or caring for lawn more thoughtfully. Your series of questions is a must-read for anyone considering how to manage the land they have or install new portions of lawn. I think part of looking at lawn alternatives is also looking at what the problems with lawn actually are, and if there are alternative ways of solving those issues. Sometimes those alternatives include having no lawn or less lawn, and sometimes it’s in managing what lawn you’ll have more thoughtfully. Thank you Gen! I agree, find the solution that best fits you and your surrounds, and make the most of it. Back in the day when the suburbs were first popping up all over the USA a well manicured lawn was a thing of beauty to admired by all passing by. A status that yes! this homeowner is a success. Unfortunately with so many suburbs now in existence and so many families strapped for time with both husband and wife working full times jobs, the lawns, unless cared for by hired lawn maintance professionals, are becoming ‘that mowing chore’ that needs to get done sooner or later. Most often the later wins. Now, with the ever rising cost of lawn maintenance it would be a good thing to start thinking out of the ‘well maniured lawn box’ and start creating yards that require less fertilizers, chemicals and maintenance. Why spend several hours a week using gasoline powered tools to cut and trim the lawn when nature provides such a nice variety of groundcover alternatives. Amen to that, let’s all thin outside the ‘well maniured lawn box’. I like that phrase! Scott, I love your approach to this topic with your logical, thought provoking questions. These are exactly the questions that a conscientious, professional landscape designer would work through with a client. Obviously, your clients are lucky to have you! Scott, As Gen said, your post should be mandatory reading for homeowners. I think here in our part of the world, the more easily accepted message will be to maintain the lawn organically and really think about the size you need. For us, we’ve shrunk our lawn dramatically since the kids have grown up, and as the chief lawn mower has gotten older! Gone is the play set which has been replaced by native shrubs and perennials. Thank you Debbie! I agree in regards to lawn care in this part of the country. Its funny you mention the kids have grown up, I have great plans for the “lacrosse field” in our back yard once ours fly the coop! Scott, this is a great way to approach the idea of lawn reform. I might borrow some of these for client meetings! Thanks Susan, I’d be honored if you borrowed them! In my part of the country, a traditional lawn is less sustainable than ever, thanks to ongoing drought. So many people just give up and gravel over the whole space. We need a lot more inspiration for a happy middle ground. After seeing the many pictures on your blog Pam, I know there’s a better solution than gravel. Hopefully they’ll call you for that inspiration! I believe that lawn has it’s place and function. Excellent questions regarding the appropriateness of planting a lawn. Many of the same problems facing the citizens of the western US Christina. Your olive grove sounds beautiful, and I agree with you re: groundcovers, there are so many that are more attractive than lawn. Thanks for stopping by! Scott, I think you clearly point out the “low-hanging fruit” — the lawns that are unhealthy (struggling under mature trees), unused (the lacrosse field after the kids leave home), and getting in the way of a more useful, comfortable landscape (sunniest spot, even if it’s in the front yard, for a kitchen garden). Thanks for a great article! Thank you Evelyn! “low-hanging fruit sums it up so well! Excellent, excellent post! Thank you for not totally poo-pooing lawn. I’m neither for or against lawn. To me, to have or not to have lawn is a question of suitability, usability, sustainability, and reality. In my designs, I try to balance all these things to create designs that are useful and beautiful for the client as well as friendly to the environment. Thanks for your wonderful post on this lawn subject. Thank you Beth, sounds like we are like minded on this subject! Hopefully organics will win out for lawn care as we move forward. Lawns should meet needs- not some abstract, Central Planning Directive. Bocce, croquet, and badminton require a certain polish. Soccer, cricket, and touch football, not so much. A shaker of martinis and a pair of Adirondack chairs are happy with whatever is available. . . The lawn on my property is way too large. I chip away at it more and more each year. There is an entire section we never use and I realized as I walked the property this summer it had been more than a year since I had been there. What a waste of valuable space. Since that day I have been dreaming what I could turn it into. A meadow? An area planted with many large trees? I look forward to the solution and enjoy the process of getting there. Idea generation is the most exciting part of the project Diane, have fun with it and let us know what you come up with. Share you journey on our Facebook page if you like! I very often suggest a meadow to clients who have room. If it’s an acre or more, you might also investigate installing climax forest trees. Out here in the Pacific Northwest, one of the most revered (and also threatened) climax forest trees is the Garry (or white) oak (quercus garryana). It’s an incredible habitat tree which is said to support over 150 different types of critters on it’s own. And in the presence of a Garry oak savanah ecosystem, it is said to be able to support upwards of 500 different types of critters. I recently designed a Garry oak savannah ecosystem as a pro bono project for riding stable’s therapy trail. They just happened to have proper habitat and lay of the land and were actually in an area of historical Garry oak savannahs. The site about 10 acres of sloping terrain… already with meadow… over which there will be horse trails, and many trees added for interest, texture, and shade. In select areas, single Garry oaks, and in 2 other areas, mixed native species deciduous glades. Along the trails are lots of low shrubs and wildflowers. I don’t know where you are located, but you might do some investigation as to what type of habitat is being lost, and choose to convert some of your unused ‘lawn’ into such habitat restoration… well, if you have the correct lay of the land, soil, and other features. Certainly, a meadow will suit most locations. You can get grasses for dry or wet areas… same with wildflowers. Just be sure your meadow is 3/4 grass and only 1/4 or less flowers… otherwise it will look more dead in winter than you will like. And be sure to use mostly native grasses, and a variety of them. Meadows are fun to mow a walking path through… changing it each year if desired. They also benefit from being mowed at least yearly… and if you are allowed to burn, in many cases, that is even better (yearly). It sounds like you are up to the task. Good luck. That’s sounds like a very interesting project Beth! Please share pics if you like over on the Facebook page. No pics, at this time, other than the plan itself and photo examples of what a Garry oak ecosystem is. I did this project as part of a pair of occupational therapy students’ final work for their degree degree. When they approached me about helping them, they just happened to say the right words that made me want to help, one of which is HORSES. I’m a huge supporter of horse therapy, and a long-time horse nut. But after seeing the property and hearing that the client was open to my Garry oak idea. Well, it was more or less my dream job. Right now, it’s just conceptual, but I’m hoping the client comes through with funding to make it a reality. Such a balanced approach to the subject Scott. Of course it is horses for courses as regards site and time to maintain. But of course also a lawn can be used to set everything else off. In its shape and quality it can be as you say part of the landscape as opposed to being a separate entity. There are so many ways of doing it that if you can use ecologically appropriate grasses or alternative species it would certainly seem many of us will still need a lawn or similar space for ourselves. Thanks Robert! We may regret wanting to rake in a few months. Where would one begin to convert lawn to a more natural sustainable state? I have almost 2 acres, of which ~50% is lawn. Some of which has barely every been even walked on outside of mowing and raking. Great question Tim. You have quite a few options, and each one should start with a plan. Once you’ve decided on how much lawn to give back to the garden and have designated these areas, your budget will control the process. On the passive end, you could try sheet mulching, which involves layering materials such as cardboard, straw and compost right on top of the grass to create a bed that can be planted within a few months. On the progressive end, you could hire someone with a machine to dig up these areas, amend the soil and plant and mulch right away. For any areas that will remain lawn, consider natural alternatives to chemical fertilizers. Raking out thatch and aerating are great first steps, followed by over seeding with a low maintenance seed mix and top dressing with compost. To feed your rehabbed lawn areas (actually you will be feeding the soil and the microscopic organisms that live in it), there are many effective organic fertilizers now available, as well as products that will provide the soil microorganisms with nutrients, such as fish hydrolysate, soluble kelp, and humic acid. Also, consider adding white clover to your seed mix, it will draw nitrogen from the atmosphere and fix it into the soil, and lessen the need to add supplemental nitrogen. A Google search for any of these products, or for natural landscape and native plants for your area should provide you with a lot of information. If you’d like feel free to email me and I’ll send you a few links to get you started. Good luck with your project, I hope you enjoy the process!